"Democrats are willing to do anything and hurt anyone to get their way, like they're doing with Judge Kavanaugh,” Trump said at a campaign rally Monday. "This is election is a choice between a Republican Party that is building our future, and a Democrat Party that is trying to burn our future down," he told the crowd at a campaign rally in Johnson City, Tenn. "The Democrats only know how to obstruct, demolish and destroy, as we've seen in recent weeks — Democrats are willing to do anything and hurt anyone to get their way, like they're doing with Judge Kavanaugh." "They've been trying to destroy him since the very first second he was announced because they know that Judge Kavanaugh will follow the Constitution as written," he added. Earlier Monday, Trump said at a Rose Garden press conference that Democrats had treated Kavanaugh "so viciously and so violently.” He also stated that he had seen an unnamed Senate Democrat in a “compromising” situation involving alcohol abuse. At the Rose Garden event, Trump said his administration would not limit the scope of the FBI investigation into the sexual assault allegations against Kavanaugh. “The F.B.I. should interview anybody that they want within reason, but you have to say 'within reason,'” Trump said. Officials briefed on the issue confirmed to NBC News that the White House — which had initially placed restrictions on the investigation — has authorized the FBI to interview witnesses they deem necessary, as long as their review is completed by the end of the week. Flanked on stage by supporters carrying signs that read “Finish the Wall,” the president boasted that he “could build that thing in one year.” Morristown, Tennessee, just 60 miles west of where Trump spoke in Johnson City, has been home to some of the largest ICE raids of the Trump administration. Trump also paid homage to Andrew Jackson, a Tennessean, calling him a “great president.” Particularly after the Obama administration agreed to replace the controversial former president on the $20 bill with abolitionist Harriet Tubman, Trump and his advisers have notably given direct nods to the 19th century populist. Both Blackburn, the first woman in the state's history to win the Republican nomination for U.S. Senate, and Bredesen, a Democrat in a Trump state, have a fine line to walk when it comes to Kavanaugh. Blackburn does not want to risk alienating female voters, while Bredesen does not want to risk losing crossover voters in a state that backed Trump in 2016. Trump's Tennessee rally was his second campaign stop in three days. 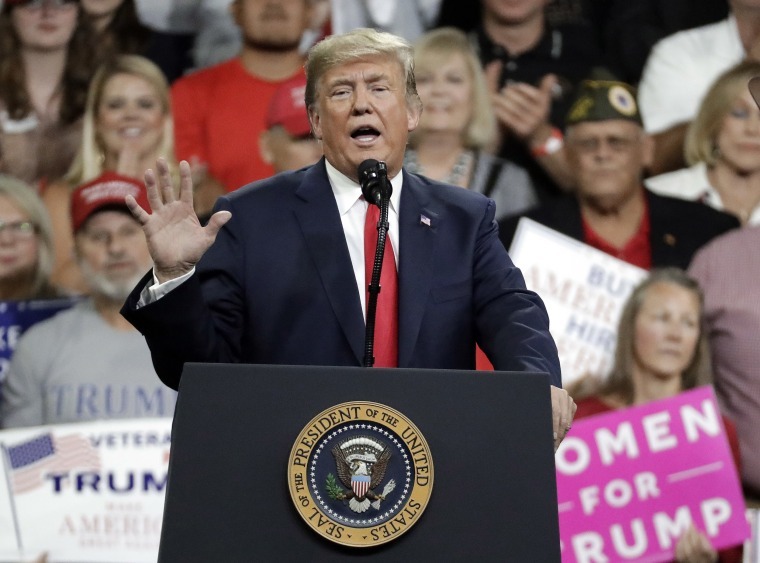 He plans to headline at least three more rallies in the next five days, appearing with GOP candidates in Mississippi, Minnesota and Kansas.